Mounting Plate - 4" x 4-1/2" x 1/4"
Bolt Hole Spacing - 2-5/8" x 3-5/8" slotted to 3" x 3"
Mounting Bolt Diameter - 3/8"
Solid Urethane Wheels are designed primarily for applications involving high moisture. Injection-molded urethane, this wheel provides extended service in moisture applications that normally destroy conventionally bonded wheels. 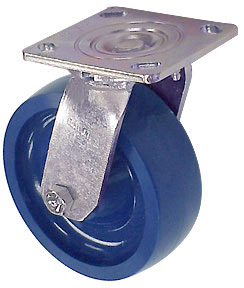 The standard durometer of RWM urethane solid wheels is 75 on the Shore D scale. Alternative top plates are available. Contact us for assistance.